Japan’s Kanazawa University launches Institute for Frontier Science Initiative（InFiniti）its flagship multi-million dollar global research-hub in interdisciplinary research in core areas including controlling cancer progression; innovative integrated bioscience; and creating future societies. Kanazawa University is one of Japan’s premier education and research institutes with three colleges and 16 schools offering courses in subjects that include medicine, computer engineering, and humanities. 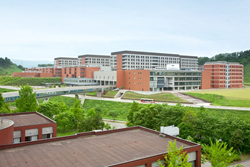 The Institute for Frontier Science Initiative（InFiniti）is Kanazawa University’s new multi-million dollar flagship interdisciplinary research hub where international groups of scientists will undertake research in areas including diagnosis and treatment of ‘nutrition related’ diseases such as diabetes and cancer; archaeology and cultural resource management; and so-called ‘supramolecules’ and ‘proton-conducting’ solids for next-generation fuel cells. Notably, research at Infiniti will be conducted by approximately 1000 scientists, covering 85 topics with annual research funding of approximately US$4 million. The Institute for Frontier Science Initiative also has funding for establishing joint degrees programs, student exchange, and hiring of ‘university research administrators’ to promote and support the project on a global scale. Journal: Cell Reports 14, pp.1–13, March 15, 2016. Researchers find similarities in the impeded signalling between central insulin activity and glucose production in the liver for both obese mice and mice that have had the vagus nerve removed. The vital role of insulin in controlling glucose production is often disrupted in people suffering from obesity, a condition approaching global epidemic levels. Previous work has shown that central insulin action suppresses glucose production in the liver by increasing levels of the ligand interleukin 6 (IL-6) in the liver. The ligand activates the transcription factor STAT3, which in turn suppresses gene expression of glucose-producing enzymes. However, how the liver communicates with central nervous system and the vagus nerve, which controls unconscious processes like digestion, has so far not been understood. Now a collaboration of researchers in Japan led by Hiroshi Inoue at Kanazawa University’s Institute for Frontier Science Initiative (InFiniti) has identified the molecular mechanism for this communication. The researchers investigated the effects of administering chlorisondamine, which prevents α7-nicotinic acetylcholine receptor activity, as well as removal of the vagal nerve. They found that while STAT3 phosphorylation and IL-6 expression in the liver increased only slightly the IL-6/STAT3 signalling response to administered insulin was lost. Kumi Kimura etal, Central Insulin Action Activates Kupffer Cells by Suppressing Hepatic Vagal Activation via the Nicotinic Alpha 7 Acetylcholine Receptor, Cell Reports 14, pp.1–13, March 15, 2016. Aims: Clarification of mechanisms for cancer progression and development of innovative cancer treatment. Drug discovery to clarify the mechanisms governing the formation of cancer stem cells and undifferentiated carcinoma. Search for molecular targets for cancer. Search and functional analysis of new molecular targets involved in malignant progression of cancer and its treatment. New cancer genetically modified mouse model and the development of patient-derived cancer tissue transplant model mouse. Aims: Next generation biotechnology and its applications for health longevity and recycle orientated society. Metabolism. Elucidation of mechanisms governing the control of nutrition and metabolism, and the development of treatments for its their failure. Development innovative molecular probe for diagnosis and treatment of diseases. Fusion of life and mathematical sciences for research on phenomena related to the life sciences. Makoto Arimura, International Cooperation Networking for Cultural Heritages Research Unit International collaboration on cultural heritage networking for cultural resources management. Development of intelligent automatic driving systems for city driving for extension to regional traffic. Renewable energy for universities to exist in harmony with local communities. Fusion of power generation and information technology and the establishment of an energy research center based on the unique features of the Satoyama Noto Satoumi region where Kanazawa University is located. Establishment of a fuel and chemical products manufacturing process by ion liquid-driven biomass refinery. Support for young researchers and graduate students affiliated with Infiniti in particular related to the promotion of interdisciplinary research; expanding international research networks; and career paths into academia. Promote the research activities at Infiniti to improve efficiency to attain outstanding results in shorter time periods. Specifically, collaborate with Kanazawa University’s Organization of Frontier Science and Innovation (FSI) to support applications for competitive research funds by the research administrator (URA); arrange regular meetings of the "Research Ne t of different fields researchers working and communication (RENCOM) to promote new collaborative research; devise strategies for effective assignment of lab space and joint research facilities; and work with the public relations office to publicize research results both in Japan and overseas. As the leading comprehensive university on the Sea of Japan coast, Kanazawa University has contributed greatly to higher education and academic research in Japan since it was founded in 1949. The University has three colleges and 16 schools offering courses in subjects that include medicine, computer engineering, and humanities. The University is located on the coast of the Sea of Japan in Kanazawa—a city rich in history and culture. The city of Kanazawa has cultivated a highly respected intellectual profile since the time of the Kaga fiefdom (1598–1867). Kanazawa University is divided into two main campuses: Kakuma and Takaramachi for its approximately 12,200 students including 500 from overseas.